I’m fortunate to know artisan perfumer Liz Moores and while I can see facets of her character in Papillon’s other fragrances it feels like her fifth creation, Dryad, gets to the core of who she is. If you follow Liz on social media, you’ll know that she spends a lot of her time nurturing animals (as well as children) and regularly shares the beauty of her surroundings in the New Forest. Unlike most of us in this day and age, Liz seems to be living her life in sync with nature; celebrating the festivals that mark the changing of the seasons and noticing the waxing and waning of the moon. She may be a glamour puss but I suspect she is an earth mother at heart. This way of life must cultivate a great sense of connectedness with the natural world and I can feel that in Dryad. I tried an early mod of this forthcoming release during a visit to Papillon HQ last year, so I couldn’t wait to sample the final version which will be available from June. A dryad is a human-like tree nymph from Greek mythology and these shy creatures often inspired love and desire in the gods. Liz Moores with her equine soulmate, Perry. As I enter Dryad’s mythical forest domain, I’m met with the unmistakable vivid green aroma of galbanum. Its usual astringency warmed by the sunshine of orange citrus and tamped down by an accord of leafy aromatic herbs. Oakmoss forms the striking emerald carpet that is underfoot for the duration of the perfume’s development. No doubt this explains in large part why Dryad bears a resemblance to vintage Vol de Nuit parfum, as Claire astutely notes on Take One Thing Off. Liz tells me that she was able to use a variety of oakmoss that is compliant, in very small amounts, with the IFRA regulations and then built it up with other supporting accords. There’s something lurking just behind the trees (costus?) that prevents the scent from being entirely wholesome. It takes Dryad from what could have been light, bright and legible and turns it into something dappled, deep and mysterious. It seems to distil the very essence of an enchanted forest. Dryad is not a fragrance with clear demarcations of head, heart and base but one of gradations, moving over time from sunlit green through to earthy brown. It’s a journey which takes the wearer from the edge of the forest to its shaded, sacred centre. Meandering through the ancient trees at a languid pace, it lasts for an extraordinary long time on skin. Like Salome, Dryad is meticulously structured. It’s the kind of green chypre/oriental with a complex character and an old soul that’s rare to find these days. A lecturer at university once remarked in a seminar that I always looked as if I were dreaming of some otherworldly place. Dryad actually takes me there. Happy New Year – and a Giveaway! May 2017 bring you everything you wish for, or at the very least, an improvement on 2016. Last year was a tough one for many so it’s quite likely you’re glad to see the back of it. I hope you had fun celebrating last night in whatever way you chose. While global events troubled me deeply, on a personal level 2016 was resoundingly positive. I managed to go from Couch to 5K and not only raised over £300 for charity but finally felt motivated enough to change my diet for the better. I also ticked three destinations off my bucket list: Venice, Barcelona and Edinburgh and even began embracing red lipstick. Starting A Bottled Rose on the 1st January made me start the year as I meant to go on. Like many bloggers, I’ve felt the pressure to post regularly but it’s been great. The blog has made me feel more connected to this brilliant community and there’s been so much great stuff to write about. Indie scents like Vanilla Smoke and Amber Tapestry by Aftelier Perfumes, Vanilla Hinoki by aroma M and a selection from April Aromatics have been particularly inspiring. It’s also been fun to continue reporting on the events run by Perfume Lovers London, which were kicked off magnificently this year by Portia’s extravaganza in January. It brought together many of dearest friends from near and far. Other highlights were a visit to Papillon Perfumes HQ, finally meeting my pal Tina G of Australian Perfume Junkies and the exquisite Scented Supper in honour of Mandy Aftel’s visit to London. Now for the giveaway! To celebrate my first blog anniversary and to thank you for reading, I’d like to send one of you lovely, intelligent, no doubt extremely attractive individuals, a a little of two of the most precious perfumes in my collection. The winner will receive a 4ml decant of Guerlain’s wondrous, rare and discontinued floral aldehyde perfume, Vega and 2ml of my beloved vintage oriental chypre Vol de Nuit parfum (also by Guerlain). As you might be aware, stringent rules and regulations now mean it is extremely difficult to post perfume outside, or even inside, the UK. However, I’m willing to take a chance if you are, so while I won’t be able to guarantee your prize will reach you, I’ll try my best. The draw is open to everyone from anywhere in the world until midnight on 9th January 2017. To enter, please tell me in the comments below which perfume/s you’ve enjoyed wearing the most in 2016, whether old or new. The winner will be chosen via Random.org on the 10th January and announced here. Michael Edwards is the author of Fragrances of the World, the ultimate industry reference book, now in its 32nd Edition. To put it simply, he is an authority on the subject. Published in 1996, his book Perfume Legends:French Feminine Fragrances sought to chart the evolution of French perfumery chiefly from the perfumers’ perspective and is the result of 150 in-depth interviews. In 164 pages, it takes us chronologically through 44 French perfumes starting with Jicky in 1889 and ending with Angel in 1992. He used the following criteria for choosing the fragrances that feature in the book; firstly, that they inspired other perfume compositions, secondly, that they started a new trend and thirdly, that they have an enduring appeal which surpasses fashion. 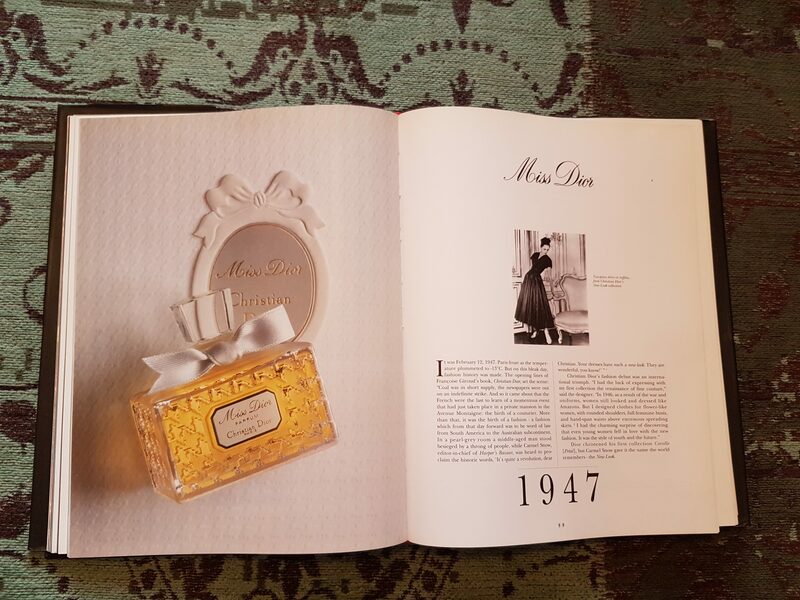 I loved reading The Foreword which was written by Edmond Roudnitska, the great perfumer who created many of Dior’s classics including Eau Sauvage and Diorissimo as well as Rochas’s Femme. Funnily enough, he mentions that when he visited Sydney (Edwards is Australian) he was stuck by its similarity to his own Côte d’Azur. Each individual entry starts with a brief summary of the time and gives the context for how the perfume came into being. This is followed by a piece about the specific fragrance explaining how the perfume was developed, usually with quotes from the perfumer, his relatives or associates. These aren’t reviews but offer up what are usually fascinating tales which try to get to the facts about how the perfume came about and why it became so great. The chemical components aren’t shied away from but aren’t overwhelming for the non-scientifically minded, like me. It’s a nice mix of anecdotes and technical information. Before ending with a section about the bottle, there is a pyramid diagram detailing the “Head, Heart and Soul” accords and epithets for each. In the case of Miss Dior these are “Spicy, Flowery and Clinging”. Here are a selection of the perfumes featured in the book from across the 20th Century: L’Origan (1905), Mitsouko (1919), Tabu (1932), L’Air du Temps (1948), Cabochard (1959), Calandre (1969), First (1976), Loulou (1987) and Tresor (1990). I really like how Michael Edwards gets to the root of the story behind the perfumes by going back to the source. Iconic fragrances are often surrounded by myths but you feel that Edwards gets to the truth wherever possible. It’s a large, beautiful, coffee table-style book but unlike most in that genre, it is full of content. Perfume Legends really is a wealth of insider information, facts and stories from the relevant protagonists or those closest to them. Unfortunately it’s a spendy purchase with the hardcover currently on Amazon UK for £149.01. Many thanks to Lila for lending me her copy. Do you have any non-fiction books about perfume to share?